From the "almost too weird to be true" file, we have the latest from Sarah Palin. Last night the former Govornor and now Fox News Contributor gave her much anticipated keynote address at the National Tea Party convention in Nashville. 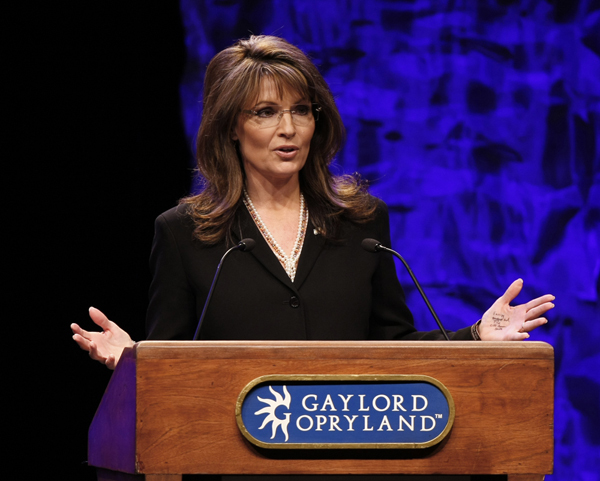 Palin called for a new populist "revolution" and stated that "We're at war and to win that war we need a commander-in-chief, not a professor of law standing at the lectern". Sure enough, she has notes scribbled on her hand. It looks like "Energy", "Budget" (crossed out), "Cuts", "Tax", and "Lift American Spirits". I doubt that this will affect her popularity among conservatives and I don't really have a big problem with her writing down some notes (isn't Fox paying her enough to afford note cards? ), but the hypocrisy can't be defended. 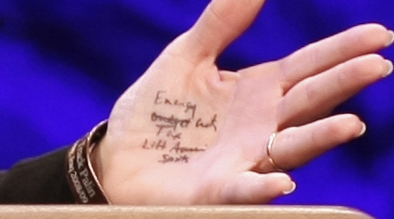 The same woman who rails against the President for using a teleprompter is now caught scribbling cliff notes on her hand so that she doesn't get tripped up in a Q&A session. Priceless.